Summer time is almost wrapped up but seminar season continues for Muay Thai and this is a big one. Typically I say almost nothing about seminars or training junkets since they to my opinion aren’t all that note worthy and as many of you know for yourselves vary very widely in quality and worth. 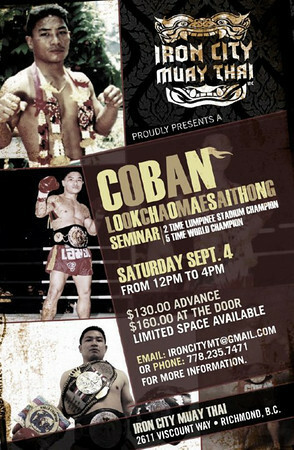 This one comes To Vancouver, British Columbia in Canada and features none other than Coban Lookchaomaesaitong. For those you that don’t already know (and you really should), Coban was a fixture of Muay Thai in the 1990s and one of the biggest Thaiboxing names of his time to go international. Coban fought more than 270 fights in his 23-year career. During Coban’s very decorated fight career he would become a Lumpinee stadium champion twice and win the world title 5 times. Coban’s knockout reels have become things of legend among Muay Thai fans. Before there was Anuwat Kaewsamrit there was Coban. Coban’s perhaps best known for his clashes with Muay Thai legend and pioneer Ramon Dekkers. The two would fight a total of 4 times with 2 wins a piece. Coban since 2000 has retired from fighting and is now training students in New York. This is a pretty big deal for people not exposed to Coban or only know of Coban from his training with the Gracie Brazillian Jiujitsu team on the east coast. Like Hermosa Boxing Works Seminar with Sangtiennoi this represents a chance to really get some in depth training from one of the champions of the golden era of Muay Thai. For more information you can contact Iron City Muay Thai at their email address: ironcitymt@gmail.com. ~ by fatsoking on August 19, 2010.
would it be possible to plug our school’s upcoming seminar on here? we have bunkerd, sakasem and coban coming the second week in september. Sure Jake let me know! awesome, thank you so much. can i have your email? i’ll send you the flyer and whatnot! Looks good Jake I’ll put something together real soon!